As covered in our previous blog entry, we shot a fun, creative video project for local men’s formalwear rental company Mr. Formal in Portland, Oregon on Wednesday, December 7. The goal of the video was to showcase Mr. Formal’s brand in a clever way, drawing attention to how their clothing can make you feel. The goal for me as company owner and writer-director was to showcase our creativity with a larger budget than most of our corporate video production work and to demonstrate that JLB Media Productions is a great resource for both affordable videos and high-end, custom video work. Having assembled a great team of professionals to work on the project, including our company’s best cinematographer from Arizona, we still had to fight nervousness for days before production because of the incoming inclement weather. After looking at the Portland weather forecast five days before production, I was immediately concerned when I saw 3-5 inches of snow forecast for Wednesday, which would have made travel to our mansion location extremely difficult for cast and crew. The temperatures and snow accumulation on Skyline in Portland are often well above the valley and downtown Portland, but with everything scheduled for Wednesday I had no choice but to wait and see. In a huge bit of filmmaking good fortune, the snow hit Portland on Thursday and we knew by early in the week it wouldn’t come until after our shoot wrapped. 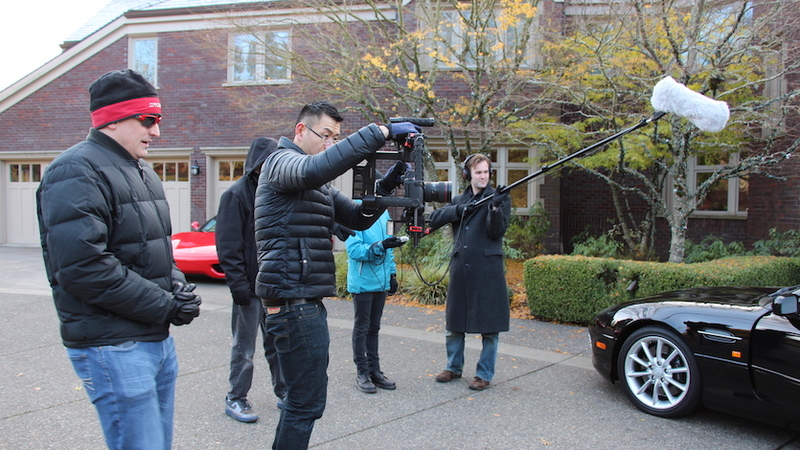 Even so, with several hours of outdoor filming involving an Aston Martin pulling up to the mansion, along with our Blonde character stepping out in his sharp suit for the first time, the bitter cold took its toll on the cast and media production crew. We filmed on the Canon 1DX camera because we wanted a more mobile production than something like our RED Scarlet camera could provide. It also eliminated the need for a focus puller (1st assistant camera) and gave us the freedom to use the camera on the DJI Ronin for stable, moving shots. Cameras and other support gear for camera systems are ultimately just tools, with no “best” camera for every shoot, but rather best equipment to fit the job. A full-featured, large professional cinema camera is a great tool for shooting high-end work, but the larger the camera setup, the more time expended before each shot setup is ready. With two locations to be filmed in a single day, we needed a more mobile option that still offered great image quality. One of the most important aspects of the shoot was the actors’ wardrobe, hair, and makeup, especially for our Bond villain, played by Alysse Fozmark. We wanted to give Alysse a much different look between her scene in the Mr. Formal store and her scene in James Blonde’s fantasy. Our excellent hair and makeup artist, Erin Toft, was able to transform Alysse from an approachable girl-next-door sales lady to a femme fatale. With commercial work, because of the short run times, you need to tell a story visually and quickly. Every image counts and every second is precious. During production, you have to think about how each shot will cut with the next shot after, because once you wrap production you can’t go back and acquire the footage you need for a smooth cut without a huge additional expense. The Mr. Formal shoot lasted about 10 hours, all to acquire enough footage to cut a great 30-second commercial and a longer 60-second version. Each shot setup was carefully planned, lighting discussed, camera moves coordinated, and ultimately shot many, many times for safety and for options in editing. As part of the creative process, lines are always changed or updated on production because of the talent actors bring to the table. For instance, we decided to have both Blonde and our femme fatale speak in British English for the fantasy sequence, once I learned both actors could pull off the accents. For the plot, the accents make sense, but I never scripted them because it wasn’t essential to the idea. It was a bonus, decided upon before we started the mansion location filming, but I think it added to the fantasy. With corporate video production in Oregon completed, we send the Mr. Formal commercial to post-production in Los Angeles where our in-house editor will color correct the footage, assemble a rough cut, and work with our director (myself) to pick the best performance takes, finesse the visual style of the edits, and then ultimately send the picture-locked version to our composer. Though the piece is short, the handling of pre-production, production, and post-production runs much like a feature film with each element being carefully crafted and meticulously handled. Having written and directed my own feature film, projects like Mr. Formal are relatively simple undertakings but still require an immense amount of time given the short run time of the finished project. I look forward to having the opportunity to direct more creative work in the future through our video production company and help other brands shine.